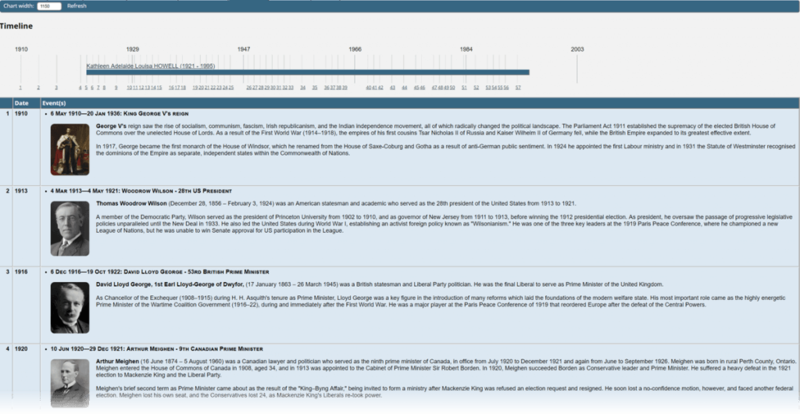 TNG's Timeline Chart provides graphical and list views of historical events during your ancestors' lifetimes - but creating the events can be time consuming. This article contains links to a canned set of approximately 410 Timeline Events that can be imported to your TNG installation to get you started. Also included are some stylistic changes to improve the usability and readability of the TNG Timeline, and notes on how to modify the styling and add new events. This content was originally developed for my own Family Tree and it reflects the fact that my ancestry is rooted in Britain. Many people from Britain migrated to the US, so I have also included major US events and, since our family history is shaped by world events, I have included many of those too. On request, I have added Canadian events. Overall, the content is likely to appeal more to British, American and Canadian family historians, and those whose families migrated between these countries. 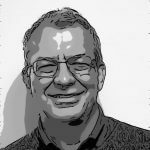 A complete preview of the content is available on my development site – here – which uses a fictional John DOE (1066-2019!) who will, due his extreme longevity, show you all the timeline events. This events set was created in TNG 12.0.2. Timeline Events have been in the product for a long time and, according to Darrin, the file format hasn’t changed, therefore this set should be compatible across TNG versions – but that hasn’t been tested. TNG does not have a merge function for the timeline events table, so this content will replace your existing timeline events. I am sure it’s possible to devise an off-line merge capability, but that’s outside the scope of this article. If you are using native TNG (no WordPress) that code should be placed in the mytngstyle.css file in the css folder of the template you are using. Note: The changes to timeline2.php are benign. They will have no impact unless you use the css classes referred to. The revised page has been sent to Darrin for consideration for inclusion in the core product. 4.2 On your server find go to the file /backups/tng_timelineevents.bak and rename it to, for example tng_timelineeventsOLD.bak so that you can restore if necessary . 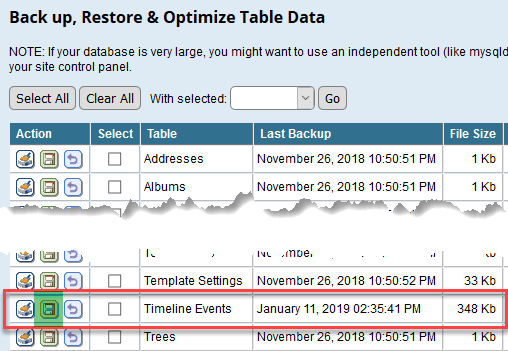 4.4 In TNG > Admin > Utilities, scroll down to Timeline Events and select the right-hand button in the Action Column to "restore" the new file in place of the old. If you are using a native TNG installation, copy the folder tl_images and all its contents to the root of the TNG folder on your server. If you view a person's record in the front end, you should see a list of events with images, correctly formatted. If the images do not display, check the path and permissions on the server are correct. The CSS blocks in Installation Step 1 above are commented to identify which Events Table elements they control., and may be freely edited to amend the style. Please make a copy of the file before making changes, in case you need to rollback. It's unlikely you will want to all retain all of the content. The TNG Admin > Timeline Events page is the place to do it. Identifying the items to delete can be a chore - but there's a way to make it easier. The image files are located in a set of folders by category. If you delete a folder the entries in TNG Admin will show the Alt Text instead of the image. This is a quick visual clue of which entries need to be deleted, instead of having to read the text. There is no undo facility to restore deleted items. In that event you will have to restore the backup file and image files and start over. Your site is really an inspiration. The lay-out of these timeline events is fantastic, it looks great and it’s such interesting “side information” to any tree… As soon as I find the time, I will create my own events on your format in order to link them more to my local history (Belgium)… When I make my “how did I construct my website”, you are one of the helpful people who will certainly not be forgotten! PS just two remarks: when going to your glossary, under TNG, the link you provide to your website starts with thhps in stead of https, which obviously doesn’t work. Once on your website, the media on your timeline don’t display… You just get the “broken link” image, like a small ripped picture. On my site, it works perfectly following your instructions.